The bridge leads to the Talcott Ravine. The road through Talcottville, Vernon's Main Street, began as an Indian trail - one of several connecting their village in East Hartford with Shenipsit Lake. Since the Hockanum River frequently flooded the trail, near its juncture with the Tankerhoosen River, followed the edge of an elevated area to the east. This elevation, the last drop of the Tankerhoosen River before it merged with the Hockanum, will power the series of mills leading to the village of first Kelloggsville and later Talcottville. Although we don't know exactly what the land looked like when Indians ruled the area there had to be a crossing of the Tankerhoosen just above the falls. Perhaps a ford originally, then a rough bridge of logs, and as the settlers arrived sturdier bridges which likely washed out with Spring freshets. About 1800 when John Warburton built a dam for his mill and created Talcottville Pond, part of his work likely included improving the bridge. The bridge had to be sturdy and reliable as he built his house on the north side of the river and his tavern and inn on the south side with stagecoaches regularly stopping at the inn and using the bridge. The remaining filial, once at each corner. The current bridge was built in 1885 or 1891 (dates vary) by the Berlin Iron Bridge Company. 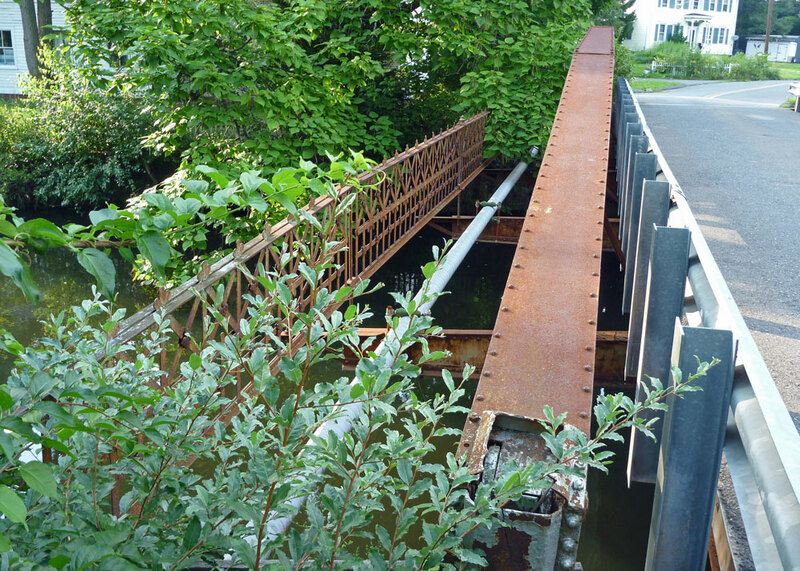 Previous bridges may have been destroyed by flood and replaced several times. There was a major flood in 1869 that destroyed one of the two Talcott mills. The 58 foot bridge, formally known as state Bridge No. 4575, is a wrought-iron lenticular pony truss, and is one of the best preserved of about a half-dozen of this type left in the state. 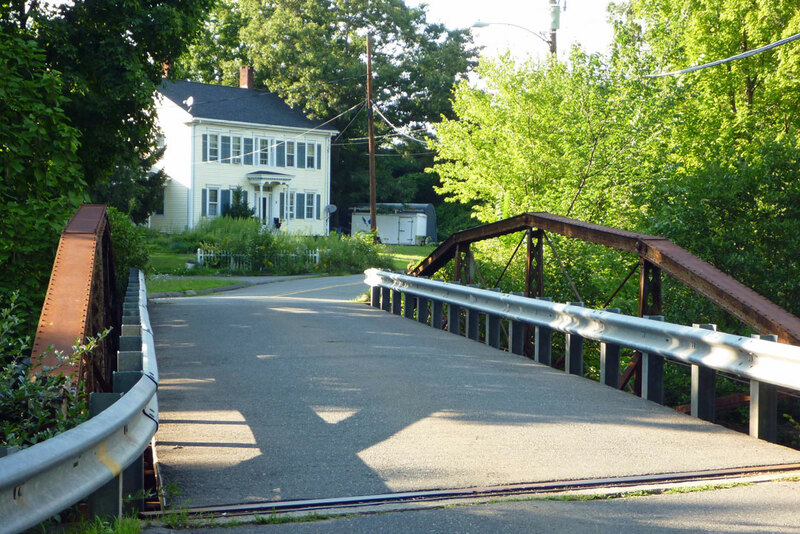 The Berlin Iron Bridge Company was Connecticut's only large-scale fabricator of metal-truss bridges in the 19th century. Some 400 employees worked at its East Berlin plant, and hundreds of others worked in the field erecting the bridges. Over 1,000 Berlin bridges are believed to have been built before 1900. The company primarily built small-town highway bridges using its patented lenticular or parabolic truss design. 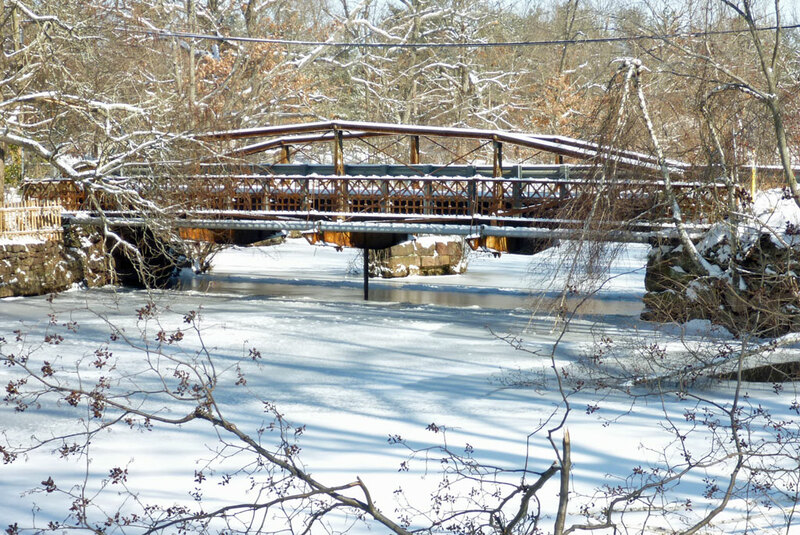 Our Talcottville bridge is typical of the Berlin Iron Bridge Company's smaller spans. It uses tapered uprights, floor beams that are deeper in the center than at the ends, 'hairpin' hangers connecting the beams to the lower chord joints, and the company's distinctive lattice railing with cast-iron rosettes. Only one orb-shaped finial remains as a postal decoration, but such finials once graced the other corners of the bridge as well. Architectural details include a decorative iron rail along the pedestrian walkway. The bridge was last renovated in 1995. It is now supported on an I-beam structure hidden beneath the deck. On the west side was a sidewalk, now supports a gas line. Trolley tracks crossed the river on separate pedestals on the pond side of the bridge and are still visible. 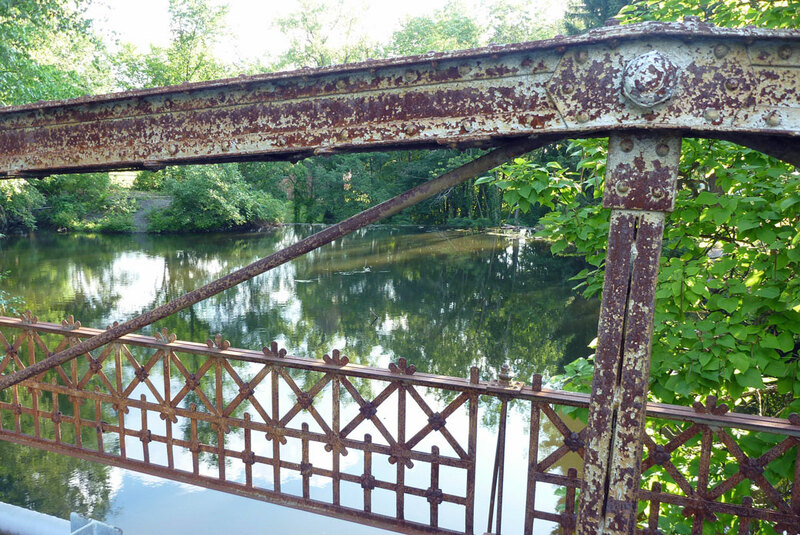 The bridge is listed on the National Register of Historic Places as part of the Talcottville Historic District. The iron bridge from the west. Rusty iron & lattice railing. Once a sidewalk, now a gas pipe. Today (2017) the bridge is in poor condition and Vernon is studying the feasibility of retaining and preserving this historic structure, which presently serves only three houses and is not strong enough to sustain the weight of modern emergency vehicles. For the past year engineers from Dewberry under a Federal grant, have been creating options for us. On May 31 a Public Information Meeting was held at Town Hall to review plans and obtain resident input. Of the four options proposed the preferred one is the concept with minimal changes and maintaining most of the historical features. The new bridge will remain one lane with an adjacent pedestrian path. The location and alignment won't change, the stone abutments will remain visible but new supports will be hidden behind them. 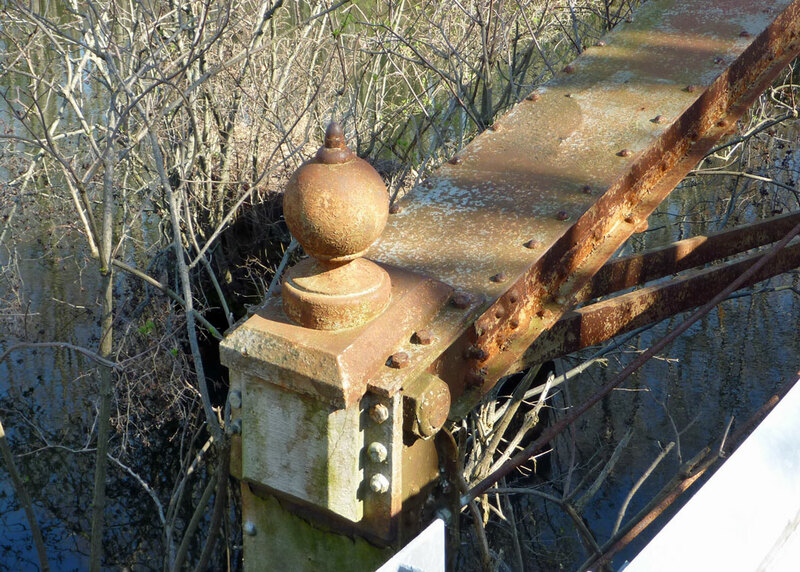 Rust covered iron rails will be removed, cleaned, painted and restored. The gas line will be tucked under the bridge and out of site. And the trolley pedestals will still be visible upstream. There are many approvals needed before construction can begin. Once underway the project is expected to take about 9 months from Spring through Fall. The cost will be about $2 million (80% Federal, 20% town) with the earliest projected date being 2019. The money is currently budgeted so a referendum in not required. "Connecticut's Historic Highway Bridges" by Bruce Clouette and Matthew Roth, 1991, CT Department of Transportation, 101 pages. Available at the Rockville Public Library. Berlin Iron Bridge Company web page of the Public Archaeology Survey Team, Inc website.